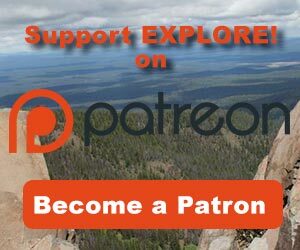 Getting in Shape for Backpacking - Explore! Getting in Shape for Backpacking - Explore! 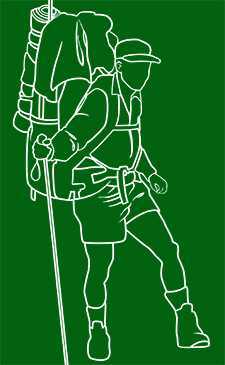 No amount of training will make your backpacking trip enjoyable if your backpack is uncomfortable. My recommendation is to try out some packs and get one that fits you properly. I solved my pack issues with an Osprey Atmos AG 65. I wrote a review of the Atmos with all the details – including a pack/unpack video. It can handle fifty pounds or more, but the second thing to do is whittle your load down to 40 pounds or less. Frankly I’m having a hard time getting it that low, but, with the Atmos, I don’t have any issue carrying the additional weight. A comparable pack for women or smaller people in general is the Osprey Aura 65 AG Pack. Once you have your pack you can load it up and it will become an important part of your training. Wall Push-Ups – While they do build some upper body strength, my main purpose is to stretch my calf muscles and achilles tendon and, thus, reduce the risk of re-developing plantar fasciitis. Squats – These are great for building the leg strength you need for backpacking, but be careful to go no deeper than your thighs parallel to the ground. Going deeper may put too much pressure on your knees and your knees are also critical for backpacking. The shower is not a great place to keep your weights and I have found them to be unnecessary. 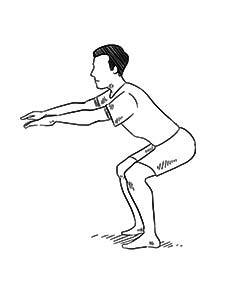 Knee Lifts – This, again, is more of a stretching exercise than a strength exercise. Knee lifts seem to add the flexibility you need when stepping over obstacles in the trail. For details, check out the article in our sister blog Power to Explore. My exercises done on a daily basis keep me at a certain level of fitness that is too low to be a major help with backpacking. So, what next? With all the possibilities, I decided that the quickest and most enjoyable way to get into shape for backpacking is to just do it. 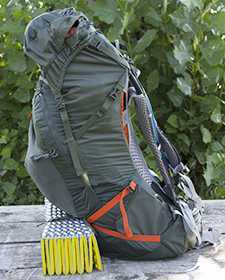 Initially, try loading up your pack and taking a half-mile walk with it. If it goes ok, you can repeat and add mileage as you feel ready. If your first half mile did not go well, you can back up and start with unloaded hiking. As you build up speed and miles, you’ll be preparing yourself to carry the pack. When you are ready, start with 20 pounds in your pack and build your distance and the weight you carry gradually as it feels comfortable to you. That’s it. A few days later I backpacked around Waldo Lake covering 8.2 miles the first day with around 40 pounds in the pack. The second day was 10.8 miles and the final day was 7.3 miles. I enjoyed the hike, but I was dragging by the end of the day and it took some Ibuprofen and stretching to get started each morning. I learned that I would enjoy backpacking even more by hiking no more than five miles a day and instead spending time exploring around the campsite or just relaxing. This approach offers more opportunities for great photography and discovery of new things than does quickly covering the miles. It is also a lot easier on one’s body. The bottom line is that if you want to travel longer distances fast, you will need to be in better shape by spending more time training than I did. This year I started training in January using a program offered by my health insurance company as a commitment device. It seems that the insurance company will pay me $50 for each of up to three health programs. I signed up for exercise and weight loss. The exercise program is simple – get 30 minutes of exercise a day for 12 out of 28 days. The ‘losing weight’ program has a number of other things involved, but the two programs overlap. Anyway, my incentive is the $50. Considering the cost of health insurance, it isn’t much, but it’s enough of an excuse for me to keep at it. I started out in January with 1.4 miles in 36 minutes with a 40 pound pack. My knees and ankles didn’t care for that too much so I backed off to hiking without a pack covering 1.9 miles in 33 minutes. My approach now is to keep hiking while increasing my speed. That should help more with endurance as well as weight loss. With limited available time, I will still jump to around 2.5 miles quickly and probably keep the distance about the same as I work on increased speed. Eventually I’ll put the backpack on and see what happens. The only useful and practical training program is one you follow. Since I’m not going to keep at a lot of calisthenics, there is no point for me in trying to incorporate them into my program. I like hiking and backpacking, so getting my training in by doing what I enjoy seems the way for me to go. 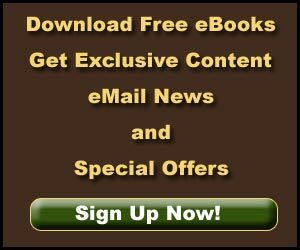 On the other hand, if you are into the gym and love that exercise approach, you might check out a program like the Adonis Golden Ratio System for men or the Venus Factor System for women. You can find my review of the Adonis system on the Power to Explore blog. Programs like these will give you a detailed track to follow to reach your fitness goals and will get you into the shape you should be before you put on the backpack and focus in on the muscles specific to backpacking. Overall, my advise is to start slowly and build gradually in whatever training approach you choose. That way you can get in shape without damaging parts of your body that are critical to your backpacking adventure. Wow! That will be quite a life-changing adventure! If you want the long trail experience, I’d suggest taking the Pacific Crest Trail from Ashland to the Pacific Northwest Trail at the Canadian border, then east to the Continental Divide Trail in Glacier National Park and, finally, south to Helena. I don’t know if that can be done in one summer, but I don’t see any other good way to get from Ashland, Oregon to Helena, Montana without a lot of traveling along roads. You could come up with a much more direct route if you want to follow a variety of roads and trails. Any route is going to be very long – it’s 1,000 miles as the crow flies! As far as getting into shape, I think the article covers that. Be sure to take a few weeklong backpacking trips locally so you can fine tune the items you need to carry with you. Less weight will let you cover more distance faster and you will need to be moving along briskly to cover all those miles. Also, spend whatever time it takes to plan your trip. You will want to get detailed maps for your route, determine mileages, places where you can get supplies, and so on so that you will known the mileages you will need to cover each day. This kind of a hike is a real mental exercise as well so get your motivation together. Let us know when you get started! ashland(colestin valley) to helenaMT-any ideas? thank you.